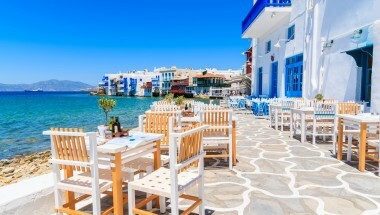 This stunning villa to rent on Mykonos sits on a hillside overlooking beautiful Agrari Beach, with uninterrupted views to the beach below, and across the sea to the nearby island of Naxos.. Situated within its own large grounds (10,000m2) at the end of a private road, this secluded, gated property is perfect for discerning guests requiring total privacy, luxurious accommodation, and large interior and exterior spaces. 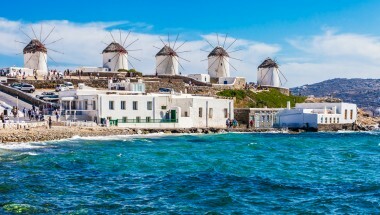 It also benefits from being just a 15 minute drive from Mykonos town. The villa (650m2) is designed as a complex of three houses: a main house with an independent guest suite on the upper level, a pool house, also on two levels, with an independent guest suite on the lower level, and a separate studio with living room and bathroom, ideal for children and/or staff. The property has been featured in Architectural Digest (USA) as one of the top houses in the world in its category. The interiors have been beautifully decorated and furnished with great attention to detail, including golden brown marble floors, wooden beamed celings, sympathetic lighting and antique furniture. Modern amenities include satellite cable television, LCD TV in living room, free Wi-Fi Internet in all areas, air-conditioning and electric heating. Spacious terraces surrounding the house and the swimming pool provide ideal space for entertaining, with numerous sitting and dining areas, and including a large wood fired barbecue. 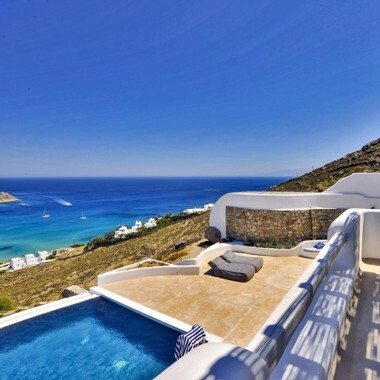 At the edge of the 100m2 swimming pool, overlooking the cliffs is a Jacuzzi. Steps lead down a lighted pathway from the poolside to a charming secluded patio carved out of the natural rocks, a quiet place to relax and enjoy the beauty of the natural surroundings. Main Level: The main house has a sheltered courtyard, entry hall with guest w.c., large living room with fireplace, dining room, spacious country kitchen, master bedroom with dressing area and bathroom, and adjacent study/office or a 2nd bedroom with private bathroom. Upper Level: On the upper level is an independent guest suite with bedroom, loft sitting room/sleeping space, kitchenette, bathroom and roof terrace. 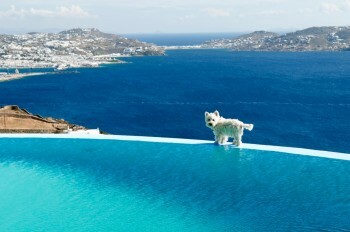 Pool House: The pool house is on two levels, with breathtaking views of the cliff, the beach and the island of Naxos. On the ground floor is the main bedroom and the living room with an open-plan kitchen. Below the living room is a separate guest room with a bathroom, which has independent entrance and a private courtyard. Studio: Separate studio with living room + bathroom, ideal for kids and/or staff. Daily maid service included. Other services on request include chef service, cocktail service, in-house massages and beauty treatments. Yoga classes can also be arranged at the villa or at a nearby ashram.